In the warm summer, take pleasure in the serenity of the outdoors at one of the pools available to Tahoe Donner℠ area homeowners. Summertime brings swimming enjoyment to the recreational pool located at the Trout Creek Fitness Center. 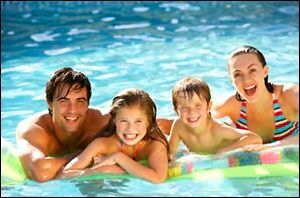 They offer swimming lessons, both group and private to homeowners in Tahoe Donner℠. This Tahoe Donner℠ area recreational pool is closed in the winter, but the Center has an adult lap pool for serious swimmers open year-round. The lap pool is heated to a constant 82 degrees. For further information about the Trout Creek Fitness Center call (530) 587-9437 or click here. Located near the Northwoods Clubhouse and two playgrounds, the Northwoods pool is an ideal place for the whole family of Tahoe Donner℠ area real estate owners to enjoy the summer. Some of the great features presented at this pool are: a water slide, wading area, picnic and barbecue areas, deep-water aerobics, and private and evening swim lessons. Children's life jackets are available and there is a lifeguard on duty. They are also happy to host private pool parties Friday through Sunday with the option of an added on pizza party with all you can eat pizza, sodas, and cookies for an additional $10 per person. 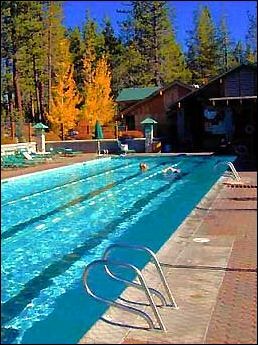 For further information about the Tahoe Donner℠ area's Northwoods Pool call (530) 582-9646 or click here.